A bit of history, noted last Friday. 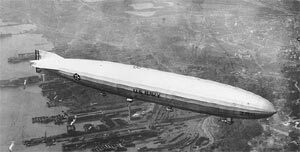 On September 2nd, 1925, the Navy dirigible USS Shenandoah (ZR-1), entered a squall line near Caldwell, Ohio, and was torn apart and destroyed. Thirteen of her 42 crewmen were killed in the crash, including Shenandoah’s commanding officer, LCDR Zachary Lansdowne, himself an Ohio native. 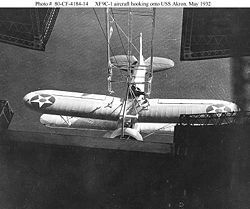 Originally conceived as long-range bombers and reconaissance craft, the airships’ role was expanded — in USS Los Angeles, Akron and Macon — to that of airborne aircraft carriers that launched and recovered their own small airplanes. 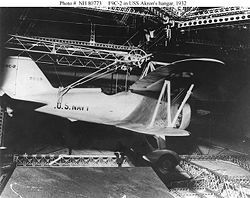 In May of 1932, while USS Akron (ZRS-4) was cruising off the New Jersey coast, LT Daniel W. Harrigan made the first landing ever of an airplane on another aircraft. All of this brought back memories of my own flying days. In the early nineteen-seventies I was working as a flight instructor at a small airport in southeast Florida, waiting (like thousands of other pilots) for a slot to open up with an airline, where I would rapidly advance, make tons of money, enjoy the admiration of my passengers and peers, and retire early with a fat nest-egg. I loved instructing, especially in the Cessna 150, which is still my favorite airplane — simple to fly, and extremely difficult to fly anywhere near perfectly. A landing in a 150 (or its successor, the 152) where you don’t know you’re on the ground until you hear the wheels start to roll is, to me, one of the most satisfying feats in flying. Anyway, one day at the airport I was introduced to a new student, a tall, distinguished man with silver hair who immediately let me know that I could call him “Ward.” I was a bit uncomfortable with that, and after some fumbling around we settled on “Uncle Ward,” appropriate, given that he was about three times my age. Uncle Ward, who had never had a pilots’ license, had an ambition to learn to fly gliders. However, the local glider club required, for insurance purposes, that everyone who flew their aircraft have at least a Private Pilot certificate for single-engine land (as opposed to sea) airplanes. 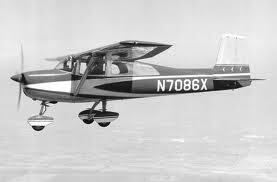 Thus began my association with Uncle Ward, and his with the Cessna 150. My new protege listened attentively as I explained, as I always did before a first flight, the rudiments of aerodynamics and how airplanes operate. This was to give the new student at least a rough idea of what he or she would be doing, and helped to allay understandable nervousness. (It’s always helpful to know that your trip to a mile above ground is supported by good, solid physics rather than magic.) After about a half-hour of ground school, we went out to the flight line, and I explained how to “preflight” the airplane — mostly a matter of making sure there was fuel in the tanks, oil in the engine, air in the tires, that the holes that were supposed to be open were, and that all the moveable parts moved and the stationary ones didn’t. After the preflight we climbed into the Cessna, started the engine, and taxied out. I asked Ward to hold the control wheel gently and put his feet lightly on the pedals so that he could follow what I was doing by feel as I explained it verbally. After taxiing out to the active runway and checking the operation of the now warmed-up engine, we took to the air. I demonstrated the operation of the controls and then turned them over to my new “uncle,” instructing him to make a few turns. He was a bit heavy-handed on the controls, but he caught on quickly, and was soon aviating along pretty smoothly, with but a tendency to drop the nose of the airplane in turns. It didn’t take long to correct that. Turned out Uncle Ward was a “natural.” After about three and a half hours of instruction I allowed him to make the traditional three takeoffs and landings “solo,” and the grin on his face when I cut off his shirttail was something to behold. I was impressed, because up until that time the only person I knew of who had soloed with that few hours was me. The rest of Ward’s flight training went smoothly. He caught on to cross-country flying quickly, although he had a little trouble with radio navigation. After a dual cross-country flight I cut him loose, and he completed the remainder of his cross-country requirements by himself. When he had accumulated forty flying hours, I called up grumpy old Charlie Skinner, the terse, cigar-smoking (but superb) FAA Designated Examiner at the Boca Raton airport. Ward departed for BCT in the 150, and returned a couple of hours later with his temporary Private Pilot certificate in hand. Many congratulations ensued. that was how I learned that Uncle Ward, the fledgling glider pilot, was in fact Rear Admiral Daniel Ward Harrigan, USN (Ret.) — the same Daniel W. Harrigan who, as a lieutenant, made the first-ever landing of an airplane aboard the USS Akron. Among other accomplishments, he had also been the first officer in the Pacific Fleet to make a carrier landing. He went on to tell us that his last landing had been in an F9F Panther jet fighter on the deck of an aircraft carrier during the Korean War, and that he hadn’t flown as a pilot since, until he climbed into the Cessna with me. Later perusal of the book (which has since disappeared, to my dismay) revealed Uncle Ward’s name in just about every chapter. My “student,” it turned out, had about as big a piece of Naval Aviation history as anyone, albeit without the fame of some of the WW II aces. He told me later that he had stayed quiet about his background because he truly wanted to learn as much from me as he could, and he thought I might cut corners if I knew who he was. I suspect — in fact know — that it was equally because he didn’t want his twenty-something instructor to be uncomfortable. 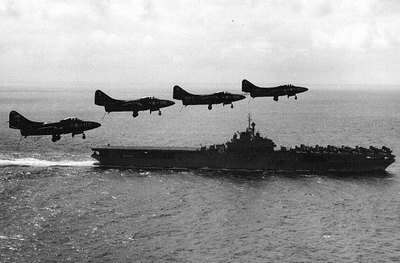 Four F9F-2 “Panther” jet fighters abeam USS Boxer (CV-21), with dive brakes, landing gear and arresting hooks down, preparing to land on board after returning from a mission over North Korea, June 1951. This entry was posted in History, Military, Nostalgia, People and tagged Aviation, aviation history, History, Military, Nostalgia, People, Reminiscence, US Navy, USS Akron, USS Shenandoah on September 5, 2010 by Bill.